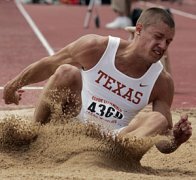 Austin, Texas, USA - Trey Hardee, a 22-year-old student at the University of Texas, turned in a strong early-season Decathlon to win the event at the Texas Relays, the traditional opening meeting of the USA outdoor season. Hardee’s score of 8465 broke the American Collegiate record of Tom Pappas, who scored 8463 in 1999. It moves him into eighth place on the USA all time list, just behind 1976 Olympic champion Bruce Jenner. If he had been able to match his personal best in the 1500 (4.42,61), Hardee would have tallied more than 8600 points. It was also a massive improvement for him, whose previous best was 8041 from the 2004 NCAA Championships where he finished second. He won the collegiate title last year with a more modest 7881 score. His 10,35 and 13,83 were also Collegiate Decathlon records, breaking the previous 100m record of Chris Huffins and the 110mH record of Jon Ryan Harlan.